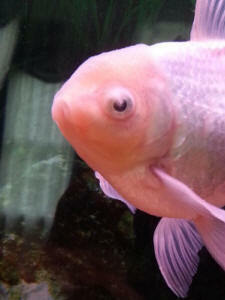 I have a 4-year-od fantail goldfish, Natasha, with a weird case of PopEye. She’s in a 55 gallon aquarium with another, smaller fantail. I weekly water changes of around 50%. 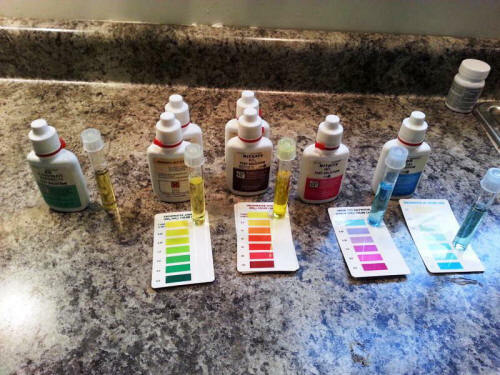 Water parameters are: pH: 70-7.2, ammonia: 0, nitrite: 0, nitrate: 10-20. The aquarium has been running for 14 years, and I’ve never detected any kind of nitrogen cycle crash based on regular testing. I feed the goldfish peas, broccoli, various beans, wilted spinach, strawberry pieces, and dried seaweed (Nori), all of which is organic. They occasionally get live earthworms, scrambled eggs, frozen Mysid shrimp, frozen brine shrimp, and frozen bloodworms. They mostly get the veggies to prevent constipation problems. There is also some Bacopa and Sagittaria planted in the aquarium, too. About a week ago, I noticed Natasha’s left eye was a bit swollen but not red. The eye was (and still is) clear, so I thought she might’ve just bumped it on something. with Seachem’s Kanaplex on Sept. 15th in case her eye was getting infected. She perked up after the first dose. By the third dose (Sept. 20 th), she was sitting on the bottom and moving only when I fed them. On the 21st, I noticed red streaks on her belly, so I started treating with API tetracycline. I took the photos on the 22nd. Since then, the red streaks on her belly disappeared, and she’s almost back to her usual activity level, but the swelling has increase slightly and is more oriented under her eye. The white streak in the second pic (popeyesm2) appears to be pus that started draining when I took the photo. The whitish area on the bottom toward the front of her eye also started draining. I don’t know what that that white, mushroom-looking thing is on top of her eye. That showed up a little before I took the photos. Is it a parasite? Since she’s been about a year old, the back, inside part of her eyes have always looked white like she has especially vibrant tapetum lucida, but that made me wonder the white areas are really something else. It’s always seemed like she couldn’t see food falling in front of her face, but she can see me sitting on the couch and knows when I get up. I’ve been feverishly reading about PopEye, eye parasites, and tumors, but I can’t really figure out what’s going on. Here eye is still clear, and she can still move it somewhat. What should I do? Sadly one of my black moors swam by a 3/4 inch syphon hose and his eye got caught. I immediately stopped the syphon but the damage was done. I quickly set up a hospital tank and sedated him, while monitoring his breathing and evaluated the injury. The hose latched on to the dorsal of the eye, detaching the sclera almost completely but a small anterior portion remains intact as well as the optic nerve. anti-fungal meds. No signs of improvement as of yet. I almost want to do a salt bath/dip to aid in the absorbing of the meds but I cringe at the thought of his open wound but I've done a salt dip to fish suffering ulcers before but this different. So what do I do?.. I have been researching potential causes and treatments for the unusual problems my telescope goldfish has been experiencing, both online and in Fancy Goldfish by Johnson and Hess, to no avail. but the usual causes of poor water quality or injury do not seem to apply in her case. 8.0 pH, 13 drops gH, and 10 drops kH. Regarding injury, I find this unlikely because both eyes are affected, and the dome structure covering the eyes is intact. I have 3 other goldfish in my 50-gallon tank, none of which are exhibiting such problems. I keep a strict maintenance schedule of changing 60-80% of the water every week, and feed a diet consisting primarily of Repashy Soilent Green and NLS Thera-A, with occasional frozen bloodworms. The tank has been established for 1.5 years (prior to that, she lived in my boyfriend's 50 gallon), and the only additives I use are Ultimate water conditioner, koi clay, and Flourish and Excel for the plants. The temp is around 68F; I add a heater to 73F to simulate seasonal variation during the spring and early summer (we don't get much seasonal variation here in California). A few months ago I noticed that her eyeballs were cloudy and appeared to be somewhat loose inside. Recently, one eyeball suddenly disappeared - it must have retreated internally as there is no external damage, but I do not know how this could have happened. The missing eyeball can be seen in the second photo. Initially, both eyes looked like the first photo. When I first noticed the opacity, I thought it could have been cataracts; however, in my experience cataracts have more of a grayish cloudiness, not the entire eye being opaque white. In addition to the eye problem, she seems to be very "depressed." She used to be very active, but now spends most of her days resting at the bottom of the tank or in the plants. Sometimes, I even see her laying upside down on her back or with her head resting on the ground and her body up. This does not appear to be related to swim bladder difficulties, as when I touch her she quickly rights herself. She just seems exhausted and possibly disoriented, with little interest in/awareness of her surroundings. She seems to have lost all enthusiasm for life. treatments to keep flukes at bay. 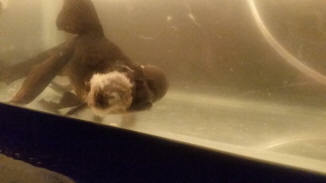 although she runs out of energy quickly during feeding in comparison to my other fish, and retreats back to the bottom. Is there anything you can think of that I should be doing for her? Thanks for the quick reply, Bob. As always, your help is much appreciated. Unfortunately, when I came home from work tonight, Adele had taken a turn for the worse. Her entire body normally has a metallic orange sheen, but now she has patches that are sort of a matte pale salmon color with what appears to be slime coat sloughing off. I lifted her up to inspect her, and part of her belly feels soft and mushy, which I know is a bad sign. I moved her to a QT tank in case she has a systemic bacterial infection that could harm my other fish. Now, she is sitting on the bottom in the corner, and breathing in an odd manner - it looks almost like a hiccup/spasm (she was also doing this in the main tank before I moved her). Sadly, I'm not sure she'll make it at this point. In your opinion, should I attempt treatment with Metro-Meds Metronidazole pellet food, or just maintain clean water for her and hope for the best? With regard to the Praziquantel treatment, would you recommend just the initial treatment upon purchase of a new fish, or is there a different medication you would use? I normally use Prazi and salt for new fish, though I did use Tetra Parasite Guard once per a fish supplier's recommendation. and need to be kept at bay. But if that's inaccurate, it's one less thing for me to have to do! thanks Bob !!!!!!!!!!!!!! Hope you have a great day !!!!!!!!!!!!!!!!!!! 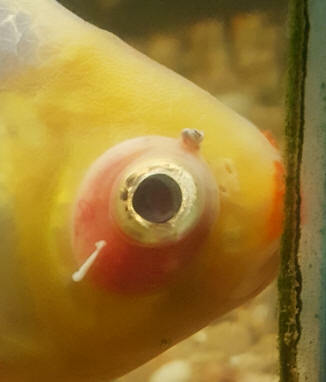 Hi, I was hoping you could tell me what is wrong with my Goldfishes eye. I saw you have a whole page dedicated to goldfish eye problems, but did not see/read anything that convinced me it is the same problem as what I am seeing. I have also attached a couple photos of the eye and test results from water tests yesterday morning, though honestly they may as well be any day of the week, any month of the year. The water tends to be very stable. If you could do anything to tell me what is wrong with his eye and how to treat it, if possible I'd greatly appreciate it. Thanks. What is your water temperature? 68 (room temperature which is normally about 68 this time of year), ~70-72 in the summer. What is the size of the tank (how many gals.) and how long has it been set up? 55, gravel, some decorative ornaments. Describe the problems you are seeing: example grains of salt on body, bloody streaks, frayed fins, fungus, staying at bottom, not eating, etc? Spot on eye. No idea if it is a tumor, fungus, etc. <This spot is very likely the result of a simple physical trauma... the fish swimming into something solid; prob. decor... and will heal in time, though this could take months, here without medication use (I would NOT medicate, nor add anything else to the water). The conditions you list, the food, water quality and maintenance are good... Just time going by. 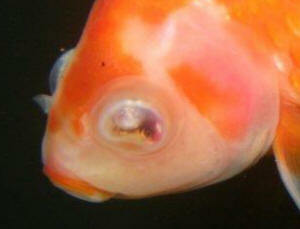 IF there were something amiss system-wise OR a pathogen at work, ALL your goldfish would be similarly afflicted. Thank you very much for the quick response! I'm relieved to hear it will probably heal in time. Just writing to let you know that your advice was spot on. His eye took a awhile to go down, but at this point it is nearly 100% healed. pictures I sent. Thanks again! that has one large white eye. He still eats and acts fine, However I noticed that it looks slightly bigger with a little area in the center you can almost see inside when he blinks? If it was to break open will he die? It looks as though it cant take getting much bigger, I have tried some meds, but nothing helps, I once showed a photo of him to an online vet, supposedly a vet?? He said it looks like a granuloma and nothing can be done for it, but never mentioned what could happen if it got bigger, it is likely from an injury 2 yrs ago or more. What do you think about this? and a bit white looking. He was still very active and eating, his in with 3 other fish the same size. No evidence of bullying, but the tank nitrates level was high so we removed him from the existing tank ( Now working on the nitrates level which are now back in a good range ) We put him in a hospital tank with a air stone and a filter with just wool in it and treated for pop eye. We used triple sulphur <sulfa> tables every 3 days for about 3 weeks he didn't seem to get any better. The other eye then stated to look bad. We then used Multicure for 3 weeks changing the water regularly and keeping the dose at the right levels. Thanks a million I will stop worrying! How long would you suggest to use Epsom salts for ? Thanks a million ! Do you only add more Epsom salt when you do a water change ? 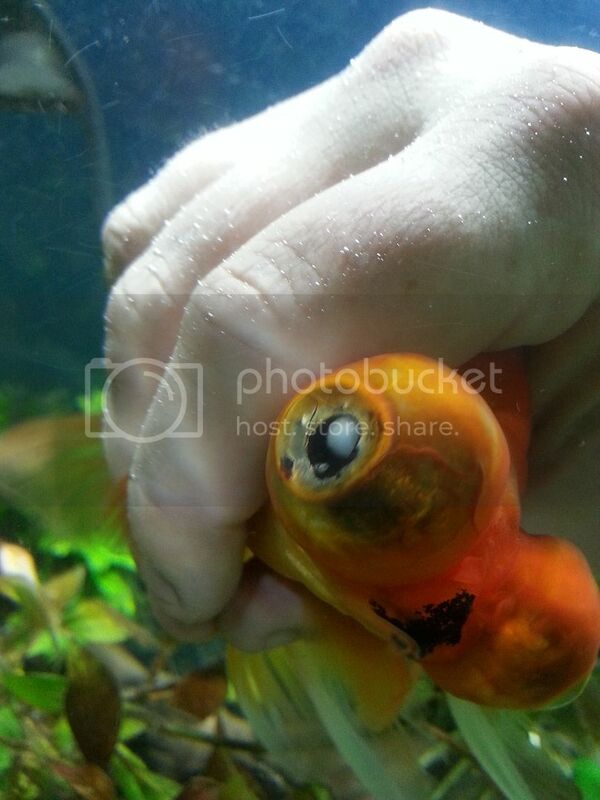 Goldfish eye problem PLEASE HELP !! Hi Sorry to be a nuisance Just checking....Don't want any more dramas ! 50 litre tank ( Australian ) so I'm adding 7.5 easpoons of Epsom salt is this correct ?? 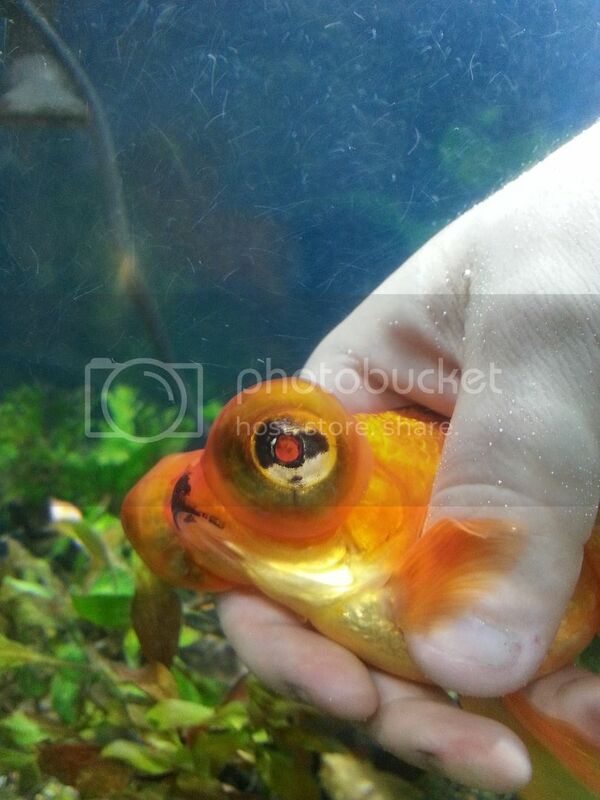 I emailed you a few weeks ago about our 4inch gold fish with Popeye in both eyes. We have since removed him from the hospital tank and returned him to his friends with the addition of Epsom salt 3 tsp per 5 gallons as you suggested a week later its so bad you can hardly see the black of his eyes. The bubbles on his eyes are clear and have just pushed the black eyeballs back into there sockets. HELP is there anything else we can do ? Will he lose both eyes ? Can they survive with no sight ? Should we euthanizes him ? The 3 other fish are fine, nitrates good, ammonium levels are good ! I have two Black Moor Goldfish. One is 4 inches long, and the other is 5 inches long (including tails). Up until recently, they lived in a 10 gallon aquarium. They lived in the 10 gallon for about 10 months. Both of the tank's levels appeared, and continue to appear to be fine every time I check them with 5 in one test strips. 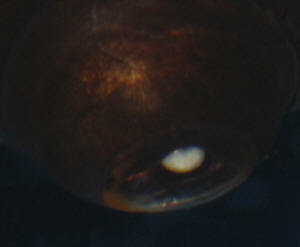 other than the back portion of the ball, which appears to go into the pupil. The rest of her eye is bright and clear, and the white part doesn't appear to keep her from seeing out of that eye, even though most of the pupil is covered. but it did not seem to help. Since then, I have watched both fish closely for any new signs of illness. Recently, I have started to notice the same thing start to happen to one of the other fish's eyes. I have also noticed that there seems to be the same thing in the bigger moor's other eye, except it looks black, almost the same color as the pupil. I have searched all over the Internet, and I have not found any answers. Could this be from the water quality, even though it appears fine? and if so, will it stop or get better now that they are in a more proper tank? Thanks! You have helped me before (thank you!) and I hope you can advise me on my current situation. I have a small Pearlscale goldfish that I have had about two months. Today I noticed that her left eye is popping out and misshapen, and it looks like there is a small glob of some kind of jelly-like substance in there, in the upper left quadrant of her eye. I can no longer see her pupil, the rest of the eye is cloudy. There may be some blood in her eye, too, but I do not think she has been injured. This seems to be all internal. She been in a 100 G cycled, planted tank (0 ammonia, 0 nitrite, 10-20 nitrates), 2 Eheim 2217 canisters, with 4 other goldfish, all of whom are fine. I moved her into a QT and bumped the heat up to 80 and started Medigold this afternoon. Tonight, though, I saw her poo and it was normal, not stringy and white. So, I am wondering is this could be eye flukes. If so, what can I do for her? I am attaching some pics. It is very alarming. I am pretty sure it is too late for the eye, it looks pretty bad, but I'd like to save the fish. 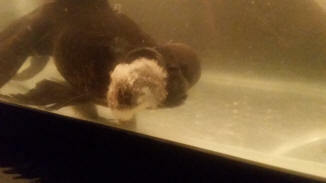 Other than the eye, she is eating, but has been hanging in a quiet corner at the top of the tank the past week or so. I am pretty sure this eye thing has developed in the past few days, as I checked her when she started hanging up there, but no outward signs of trouble at the that time. And, other than the eye, no outward signs now. (I am attaching pictures so you can see.) What should I do? while I am giving her the Medigold? I did Prazi in QT and did a salt dip before adding her to the main tank, and have PraziPro on hand. I also have potassium permanganate and powdered Metronidazole. Does it look like an eye fluke to you? The eye has a round clear bubble surrounding it that you can see from the top, so there is some buildup up of fluid/pressure there. Anything I should about that--Epsom? I tried this once a year ago when the fish first eye was bad. I am going to buy it , as this is all he keeps telling me, What do you think I should do, I don't want to lose any of them and they truly do act fine, if he wasn't going to make it why doesn't he act sick?? I don't like when everyone tells me off as I have them in a twenty gallon tank, they have room to swim and really act good, <well> why does everyone tell me off one way or another. I have had bad experiences with medicating other fish I had, they all died, I am very nervous about doing it. BUT if it means saving the well acting fish I will, Do you have any suggestions. I cant understand why a fish if so sick as people say is acting quite well?? If you don't think the system suggested using Medigold will help or hurt, what do you suggest I do for the fish?? Is it possible to have to much or oversized filter, I have a whisper 40 filter I use and a small bio wheel filter and one airstone with extra power (made for 40 gallon tank) that runs the airstone, is this too much? Hello, you mentioned in an email I must have lost, that the Medigold wont help or wont hurt, I am nervous about this so if I was to use it are you pretty sure it wont hurt them? I don't want to do that, but would like to see I guess if it would help, but if you think it would hurt them I wont! Hello I've spent a good amount of time using the highlight feature on your site, and I can't seem to find an answer to my question. I hope you will be able to answer it for me. About 4 months ago my friend and I got a black fantail goldfish, and in the beginning he seemed to do just fine. Recently though his eyes appear to be bulging (even more than usual) and the "whites" seemed to be filling up with a cloudy fluid. At first we thought this was just a normal part of the growing process, but now one of the eyes appears to have some sort of brown fluid in the bottom of it. It almost looks like when a human bursts a vessel in their own eyeball. I'm not an expert on fish anatomy so if this is as simple as when a human bursts a vessel I apologize, but something about it just doesn't look right. Luckily the condition does not seem to be impacting his vision. He still swims right to the top of the tank when either of us walks up to it to feed him. We would appreciate it if you could give us some information on this situation, and if you know of any remedies for the poor little guy's condition. I greatly appreciate you answering emails and having so much information on your site, considering that goldfish are incredibly difficult to maintain in good health it seems. <Not really difficult, but the problem is that people buy Goldfish WITHOUT doing any research first, assuming they're as easy to keep as a houseplant. I have two telescopic fish, one is a calico named Posie and the other is a black moor named Petri, after sitting, researching and reading your site for some time I have realized that I need to move them as soon as possible to my larger tank that I have sitting around, possibly get a new filtration system for them and I'm feeding them all the wrong foods, so those are definitely contributing factors to whatever problems that seem to keep popping up within their domain and amongst them, but I still have a few questions I didn't find answers to and I'm really hoping you can help me! think they are a year and half old now(?) or there abouts), that stress coat and stress zyme are the best options for clarifying and maintaining a good chemical balance, is this true? <No. Do start by reading here about Rift Valley salt mix, a very cheap, easy way to provide the hard water Goldfish need. Use about 50% the dose listed there for Rift Valley cichlids. This will cost pennies a month! Or am I using the wrong products? I also have a tetra whisper ex20 filter system for their 15 gallon tank; they are both about three inches long including their large flowing tails now, hence why I need to put them in the bigger 30 gallon tank, but I read that trickle filters are not the best filtration for goldfish. This may be a stupid question but is the filter I have considered a trickle filter? If so, what filter would you recommend I get? <The best all-around filters for Goldfish are internal canister filters. I also have the Kollercraft Tom 360 Degree Cylinder Tank 2 Gallon, and it came with what they claim is a filter but seems to just make bubbles, and I was wondering if I could use the "filter" that came with that tank as an aerator for them? When it comes down to the physical ailments, in general, they seem okay, not bad, but not great either. Petri and Posie both seem to have the "pine cone" like scale protrusions, but I don't think it's dropsy. Their scale protrusions seem to be very randomized and they have very few, I'd say 5 scales protruding on each side tops, and it appears that those scales are shinier and lighter in color, and seem to reflect light very differently from their other scales which makes the protrusive scales stand out incredibly. The reason I don't think it's dropsy is because they don't have any bloat or any of the other dropsy symptoms at all, in fact in general other than their strange protrusive scales they don't seem to have any other ailments than the water's terrible chemical balance. It's completely ALL wrong; which I will be fixing. The most puzzling thing which is in the headline of this email, is Posie's eye bubble within his eye bubble. I have never heard or seen anything like this before. to make of it. It's not swollen. He doesn't seem to be in any pain. There doesn't seem to be any blood or secretion and its relatively new. I'm quite sure it wasn't there yesterday. I have no idea; Do you know what it is, and how to treat it? Is this some strange new deformity? Is it water and eye damage? Please help me. I can take a picture if you think that would help clarify his strange condition better but I do not have one at this moment. The case of one swollen eye below recurred after about a week, and then developed into swelling to the face; I figured it was internal bacteria and as it wasn't getting any better I reluctantly used the Furanol 2 (I think the tank pH had crashed; I'm trying to remedy the soft water gradually with JBL Aquadur now). Unfortunately, the Furanol 2 treatment involved removing the bacterial filter. I managed to get the filter back in the tank yesterday after the original symptoms improved and I changed out enough of the medication. However (deep sigh) today the fish has three or four white spots on his head and back- at first I thought Ich, but it's not grainy, at least not in the larger spots, perhaps more fuzzy and white in the middle. Maybe columnaris or fungus? My dilemma is, I can medicate for columnaris but I REALLY don't want to take the filter out again (Ektol will require the filter to be removed). sorry for being a pain; I feel like this is becoming an epic! Hi guys- I've read a lot of your FAQs but I'd appreciate some specific advice. One goldfish, large filtered aquarium- 100 L I think; not a new tank or anything, I've had him for about 12 years or so. Diet of peas and goldfish pellets. Water changed regularly, but it was a bit late the last couple of times as I've been quite ill myself and didn't have a choice. Nitrite test reads in the <0.3 mg/L category, which is as low as it goes, but it's an old kit, may not be reliable. I know I should get a new one but as I say I've been preoccupied with some health problems. 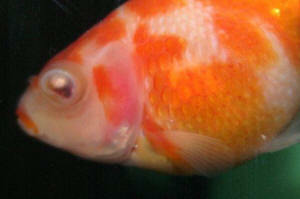 Noticed last night that fish has one swollen eye, really swelled up. As far as I can see no other damage to the fish and the other eye looks OK (I never really studied the eye before so I'm not sure how it normally looks!) It's normal compared to the other one. So likely trauma? Did a 30% water change last night. I'm living abroad (yes, I brought my fish but it was a year or so ago so the tank is established), I don't have good local language skills and I'm worried I won't find Epsom salts. I can order them online but it will take 5 days plus to get here- will that be too late or still worth it? order the Interpet anti internal bacteria (probably takes about a week; I normally used the Interpet medicines in the UK) or should I try and order an antibiotic from the US- that could take ages! If water quality is unsatisfactory, shall I assume infection and that he needs antibiotic? while the medication is in? If I can't get Epsom salts, is there anything else I can do to try and save his eye? I'm quite terrified at the thought of it falling out! Is there any hope? Hi Neale- thanks ever so much for the advice, it's wonderful to have somewhere to turn to! The eye has now thankfully gone down a great deal and I think it will heal by itself, so I think I'll just maintain the water and not treat it with anything. I'm actually in Finland rather than the UK- Epsom salts proved difficult to get here, in the rare eventuality that anyone asks again, but I did get hold of an antibiotic JBL Furanol2 which I'll hold on to in case I need it in future. I just measured the tank and by my calculations it's 128L (though not 100% full of water), which sounds by your advice to be an acceptable size? The filter rate says 220-570L/hr. Thanks again from me and my fish! Please would you be kind enough to advise me further regarding treatment of my newish Panda Moor. A couple of days after I purchased him I notice that his left eye was rather swollen. There are no signs of any clouding of the lens or any fungus etc. His other eye is normal. He seems to be having difficulty seeing his food to eat it but after hoovering around on the surface he usually ends up finding it. I have tried the Tetra Gold sinking pellets that I got but he is unable to see them and leaves them and I end up having to remove them, so therefore I have stopped using them. He is currently in a 12 litre quarantine tank with a filter. I have tried Myaxzin for 5 days but sadly there seems to be no improvement. <Never found this stuff much good myself. Anyway, contains Malachite Green, Formaldehyde and Acriflavine, which have a mild antibacterial affect with regard toe external infections. I have had the water tested by the local Aquarium shop and they said it was fine. Unfortunately, I did not ask for the exact test results, as from reading other entries you probably need them to help me further. I have read the entries about using Epsom Salts and Metronidazole. Unfortunately I am still unsure as to the best way forward as there seems to be a divide over the most appropriate treatment. I don't really want to delay as I would like my poor fish to have the best chance of a full recovery. Thank you so much for taking the time to read this, and thank you in advance if you would be able to help me! It would be most appreciated by myself and my little panda moor. Firstly, may I say a huge thank you for getting back to me so quickly regarding my poorly panda moor. Secondly I forgot to mention in my first e-mail what a great site you have and the wealth of knowledge is astounding! Anyway, I have followed your advice and I have managed to get hold of some Metronidazole and I have administered it to him in a continuous bath, changing 25% of the water and adding another dose every other day. I am very wary of adding it to his food, perhaps you would be so kind as to advise me further on this. After a few days of treatment he (could well be a female! ), seems to have improved a little, certainly seems a little more lively and seems to have a better appetite. 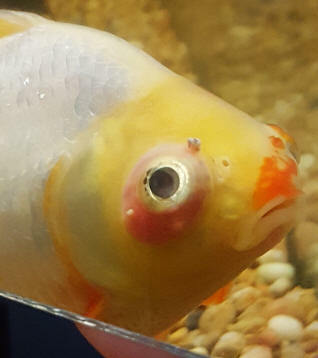 His eye has gone down a little bit but it has got a white ring around its base now, is this just the overextended eye muscle? How long should I expect it to be before the eye returns to normal? I am rather compromised at the moment with tank space and I am unsure what to do for the best. I am looking into getting a bigger tank in the near future, so the current setup is only temporary. Thank you so very much for all your kind help and advice, it is very much appreciated. HI I have been chatting with you off and on about a goldfish I have with Popeye, it seems to be getting bigger, he still eats good etc. Will it burst? Is there a medicated food I could give him to cure this or any suggestions on how to help it to improve, He has had it now for about 2 months? I have never heard of a fish vet around here? If there is one it is probably 8 or better hours from me!! Do they usually die once they get Popeye? I have tried some Maracyn 2 but certainly not enough I know as I really didn't want to use it so I just pour a few drops of powder in for a few days, I have something called triple sulfa and wondered what you might think of that, I did see online that medicated marigold fish food containing Kanacyn can be purchased, or another from jungle labs, it says it is broad spectrum food? <The broad spectrum stuff is what I'd probably avoid. If this was me, and I had access to a range of antibiotics, I'd be working my way down the list of likelihoods, in each case choosing an effective, if narrow spectrum, antibiotic. The thing with broad spectrum medications is they tend to be "jack of all trades, master of none" products that sound good but often turn out to be unreliable. Instead, try a gram-positive antibiotic first. Okay, Then Do I just keep water clean and wait till eye falls out> It sounds more as if your saying not to try to medicate as this is not fixable until eye falls out? Is this what I do then , just wait? I got a bit confused as you said one of yours had this problem and it is okay, what did you do? I am sorry I am confused, if this cannot be fixed should I try antibiotic food or just wait till eye falls out? It just sounds like in most of the replies that in most cases the Popeye is not fixable once they get it? Would this help along with some Epsom salt, I cant find any Nitrofuranizole?? <Haven't come across these as recommendations, so they probably won't help. Not all antibiotics are the same, whether you're treating fish or people. I will keep trying to find Nitrofuranizole but wondered about these, I do have some triple sulfa here at home but haven't used any yet, need more advice before I start anything. I talked about the one fish I have in a tank with 3 others with the bulging eye, and in another tank I have one larger one with cloudy eye and now has 2 tiny red slightly raised red sots on the top of body near fin at top, I did bump him with a net a few days ago, don't know if that would have done it. (have never used the plus before,) could that have caused his red bump? Hi, I finally found some medicated fish food with Nitrofurazone in it. It is Jungle bacteria medicated food, I am concerned it is okay to use for this as I have been trying Melafix, Epsom salt and water changes etc. He eats good and looks bad, I want to save him but am worried about using something that goes right in the system, do you think it is okay to use? <Popeye is a bacterial condition where the bacteria are living behind the eye socket. It is very difficult to get the medication behind the eye. Can it make him worse? What do I watch for to stop using it? Thank you all again for the help these photos come out a bit dark but give an idea what he looks like, nothing is red just moth eaten scales and Popeye? ?